Look at my boy, trying to eat a leaf. That is kinda the story of our lives right now, Simeon learning about his world and me trying to keep him alive! We have had a difficult few weeks, the death of a dear friend, then Daniel and I had a terrible stomach bug, and Simeon had two more teeth come in. But we are very thankful for our blessings: the gorgeous weather, our healthy little boy, introducing Simeon to the joys of playing in a baby pool, and our families and friends. So we have been trying to make the most of our spare time and while the weather is nice we've been trying to get outside. After our garden fail last year we've been working on some changes to our garden. A friend of ours got us this book about raised bed gardening Square Foot Gardening. I highly recommend it to anyone interested in a small backyard or in our case side yard garden. So the author has a specific dirt mixture he recommends, we tried to add to ours rather than discarding everything we had. Daniel marked the bed off into squares to help us plant without overcrowding. We also purchased a tumble composter from Lowes and got rid of the nasty rotten "compost trash bucket" we had going. We haven't harvested any of our compost, but I'm looking forward to using it. I started some carrot and lettuce seeds, and being I started them too late and too deep it's a miracle any of them came up. 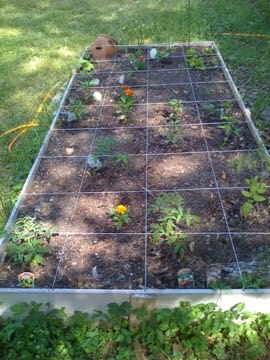 Then we bought tomato, peppers, onion, and an eggplant and set them out. Once again we have invested a good chunk of change in the garden and are really hoping to actually harvest some veggies this year. Wahoo - I pray for a bountiful (square-ish) harvest! Do post after pics!! Yay, for you two. Ya'll make me want to graden like my parents do.